Cameron Smith is an ordinary high school boy who just wants to go through life with the least amount of effort possible. He is dissatisfied at home, with distant parents and a perfect sister who hates him, and slacks off at school, going to the "smoker's lounge" in the upstairs bathroom instead of class. Cameron's only interest is Eubie's, a music store near the college where his dad works. At this music store, Cameron likes to pick up CDs of his favorite artist, the Great Tremolo. Cameron has a fairly ordinary life until he begins to experience strange hallucinations, excruciating pains, and involuntary body movements. After a trip to the doctors office, he is diagnosed, fatally, with Mad Cow disease. With limited time left to live, Cameron spends his time in the hospital. One day, a punk-rock angel named Dulcie appears, and tells him there is a way to cure his disease, and save the world. He must go on a crazy journey to find a mysterious "Dr. X", who has unwittingly unleashed dark energy onto Earth, causing Cameron's disease, and also the end of the world. Cameron must leave immediately, taking with him his acquaintance Gonzo, a dwarf with a controlling mother and extreme germophobia. At first, Cameron believes Dulcie is a hallucination. However, with no other options other than to die or give this crazy plan a shot, he convinces Gonzo to escape the hospital that night. Dulcie tells Cameron to "follow the signs" to tell him where he needs to go. With that in mind, Cameron and Gonzo take a taxi away from the hospital until they see a sign advertising a bus station. They take the only bus that evening, a bus heading the New Orleans for Mardi Gras. Once Cameron and Gonzo arrive in New Orleans, they search for a club Eubie had told Cameron about, called the Horn & Ivory club. Eubie had said that this was a club where famous jazz musician Junior Webster used to play, before he died. Cameron and Gonzo manage to locate the club, where they discover that Junior Webster is in fact, alive. However, as Junior is playing his set, he is challenged by a mysterious figure who Cameron refers to as "the Wizard of Reckoning", as figure Cameron had encountered previously in his hallucinations. Junior and the Wizard have a music battle, which ends in Junior's death. Junior gives Cameron his horn as he dies. Cameron and Gonzo leave New Orleans, taking a bus bound for Florida. Unfortunately, Cameron and Gonzo become stranded at a rest stop, far from their destination. They are picked up by a group of teenagers and young adults, who take them to an extreme "happiness cult" called CESSNAB. Cameron is sucked in by the ideals of CESSNAB for a few days, but he is eventually able to escape with Gonzo. After leaving the cult, Cameron and Gonzo spend the night in a motel. Cameron cannot sleep, so he heads to a rest stop. At the rest stop he meets a couple people who invite him to a local house party. While at the party, Cameron meets a talking yard gnome who insists he is the Norse god Balder. 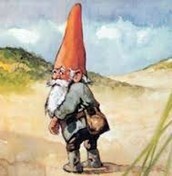 The gnome convinces Cameron to free him, and Cameron takes Balder with him on his journey. The group eats at a diner, where Cameron encounters the "fire giants", huge, mysterious figures who have also been showing up in his hallucinations. They flee, and go in search of a car. Cameron, Gonzo, and Balder acquire a car, and learn they have a bounty over their heads. 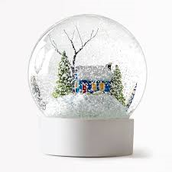 Now on the run from a large company known as "United Snow Globe Wholesalers", who is offering the bounty, the group continues to head towards Florida. They make a quick stop at a research center for fringe theories, known as Putopia. Cameron is transported through a device said to take him through alternate dimensions. Cameron returns safe and sound, but not without noticing a few subtle differences in the world around him. Continuing on their way to Florida, the group picks up a group of college boys, who are headed to a huge reality TV party at a place called the "Party House". Cameron and Gonzo drop off the college students at the Party house, realizing too late that they have stolen Balder. Cameron and Gonzo, driven by a desire to rescue Balder, head back to the Party House. Cameron inadvertently signs up for a reality TV show called What's Your Category? which he wins. After winning the show, Cameron and Gonzo set off in search of Balder, finding him at an auction. They lose the auction, and attempt to steal Balder from the backstage area. They are confronted by a TV personality, Parker Day, who tells them they can take the gnome, in exchange for Gonzo to appear on a reality show. Gonzo obliges, and Cameron heads back to his hotel room. Cameron is very worried for Gonzo, but upon meeting up with him again, Gonzo informs him that he had a great time, and even got a boyfriend. Cameron and Gonzo get ready to leave, but they discover that the world's most famous band, the Copenhagen Interpretation, has returned after a mysterious eleven year disappearance. The band is set to play a concert right there at the party house. Cameron realizes that the Copenhagen Interpretation are the key to stopping the end of the world, and manages to use the music at the concert to do so. With the apocalypse averted, Cameron now focuses on finding Dr. X and curing his disease. He heads to Disneyworld with Gonzo, where he believes Dr. X to be, but is found by United Snow Globe Wholesalers. After a brief battle, Cameron and Gonzo escape, but not without the death of Balder and the imprisonment of Dulcie in a snow globe. Cameron and Gonzo continue to Disneyworld, where they yet again are confronted by United Snow Globe Wholesalers. Cameron leaves Gonzo behind and goes to rescue Dulcie on his own. Cameron ends up in the "It's a Small World" ride, where he had a near-death experience as a child. He walks through a small service door in the ride, and ends up in a room with Dr.X. Cameron has a brief discussion with Dr. X, in which he realizes that Dr. X cannot cure Cameron's disease. The Wizard of Reckoning appears, and it is revealed that the Wizard is Cameron, and that the whole journey Cameron has just undertaken is a figment of his disease brain. There is a brief chase sequence, that ends in Cameron using Junior Webster's horn to banish the Wizard once and for all. The room that Cameron had been in vanishes. He flickers between different realities, including the hospital where he was staying in the beginning. Cameron overhears a conversation between a nurse and his parents, right before his whole world goes dark. Cameron is in a very dark place. As he adjusts, he realizes he is back at the "Its a Small World" ride with Dulcie. They board the ride, and the reader is left without any conformation as to where they go, and whether any of Cameron's journey was actually real. The theme of this novel is that in order to change and grow as a person, one must be pushed out of their comfort zone and forced to do things they do not expect. This theme is supported several times in the story, with different characters. The first character who goes through an obvious change is Gonzo. In the beginning of the story, Gonzo is neurotic, and constantly experiences fears that his mother has pushed upon him. As the story progresses, the reader sees Gonzo become more open and trusting, and less fearful. Gonzo takes on experiences and opportunities that he never would have dreamed of before, including going on a reality TV show and getting a boyfriend. Another character that goes through a slightly more subtle change is Cameron, the main character of the story. In the beginning of the story, Cameron does not really care about anything, and desperately wants to get away from his parents. He is also infatuated with the popular girl at his school, Staci Johnson. Throughout the story, Cameron begins to develop deep feelings for the angel Dulcie, and begins to care about the quest and his friends Gonzo and Balder. At the Party House, when Cameron finally has a chance to be close to Staci, he realizes that he does not like her at all anymore. These changes show that without Cameron's journey, neither he or Balder would have grown as people. The point of view of this novel is first person. This point of view allows the reader to see into Cameron's thoughts and actions, but not those of other characters. This is important because it helps the reader to identify with what Cameron is going through. This perspective also adds suspense to the story, because the reader knows only the same things that Cameron does, and not more. The main character in this story, Cameron, is clearly a dynamic character. 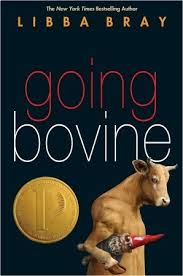 Cameron goes through immense changes throughout the novel, leading him to be a completely different person at the end of the novel than he was in the beginning. As stated in my explanation of the theme, Cameron becomes a more caring and less apathetic person than he was in the beginning of the story. Cameron also lets go of his previous, shallow beliefs, such as his infatuation with Staci. Cameron stops making fun of The Great Tremolo, and finds true meaning in the words he is singing. Of Cameron had stayed a static character, and not undergone these changes, the story would become boring and pointless. If Cameron had not changed as a person, there would be no result of his journey. This would also cause the reader to lose interest, because Cameron would stay as shallow as he was and not become a more interesting character. One of the reasons why this story is so engaging is the use of comic relief. The story is comedic throughout, which keeps the story from being to dry or serious. The comedy helps to break up any parts that might be confusing, boring, or heavy, and gives the reader a way to connect with the characters. One example of a running joke throughout Cameron and Gonzo's road trip is the bumper stickers that they make up. Some of these include "Quantum physics has a problem of major gravity", and "I thought I was having an existential crisis, but it was nothing". As a reader, the use of comic relief in this story was one of many factors that kept me engaged in the story. Foreshadowing plays a very significant role in this novel. The foreshadowing in the story hints as to what is to come in the end of the story, but keeps the reader guessing and wanting to find out more. One example of foreshadowing in the frequent lapses in reality that Cameron experiences. Throughout the story, Cameron seems to switch back and forth between the hospital, his journey, and a couple other locations. Cameron brushes off his visions of the hospital as dreams, so that the reader must guess whether they are real or not. This is, of course, foreshadowing to the climax of the story, when it is revealed that Cameron's whole journey has been a dream, and he is still at the hospital. This use of foreshadowing helps to keep the reader interested and engaged. The foreshadowing that was previously mentioned also plays a role in creating irony in the story. Throughout the story, the reader picks up hints that Cameron might still be at the hospital, and not actually on a quest to save the world. This creates dramatic irony, because the reader is aware of something that the main character, Cameron, is not. The dramatic irony keeps the reader on the edge of their seat, waiting for conformation or denial of their theory, and wanting to read more. Cameron's quest is driven by a singular motivation: to be cured of his disease. This motivation is what drives Cameron to keep going, even when times get tough and he doesn't know what to do. This motivation is also what forces Cameron to grow and change as a person, developing the theme of the story. If Cameron knew right from the beginning of the story that there was no cure for his disease, then he never would have embarked on his journey in the first place. This would cause his character to stay exactly the same, changing the theme drastically. On a scale of one to five, one being the worst and five being the best, I would give this book a four. 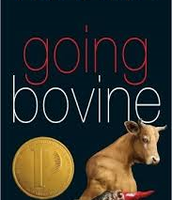 Going Bovine was engaging, funny, had an interesting plot, and left me wanting more out of the story. I enjoyed the characters, and could easily imagine myself as part of the story. The only flaw of the story was that it was a little confusing. There were so many different events that happened, and the plot was so complicated, that it was sometimes hard to follow along and connect everything in the story. The end of the story also didn't explain everything in the story, which left me with many questions. All in all, I would definitely recommend this book to someone who was up to a lengthy read and a complicated story.